Then Nicodemus, the leader who had met with Jesus earlier, spoke up. "Is it legal to convict a man before he is given a hearing?" he asked. One of my favorite stories in the Gospel of John is the story of Nicodemus. This wonderful seeker of truth came to Jesus at night because he saw in Jesus something of heaven. However, it wasn't easy for him to come to Jesus all at once. God kept working on his seeking heart, leading him closer to Jesus through the events and circumstances of both Jesus' life and Nicodemus' role as a religious leader. Eventually, the events of the cross captured Nicodemus' heart just as Jesus said they would. 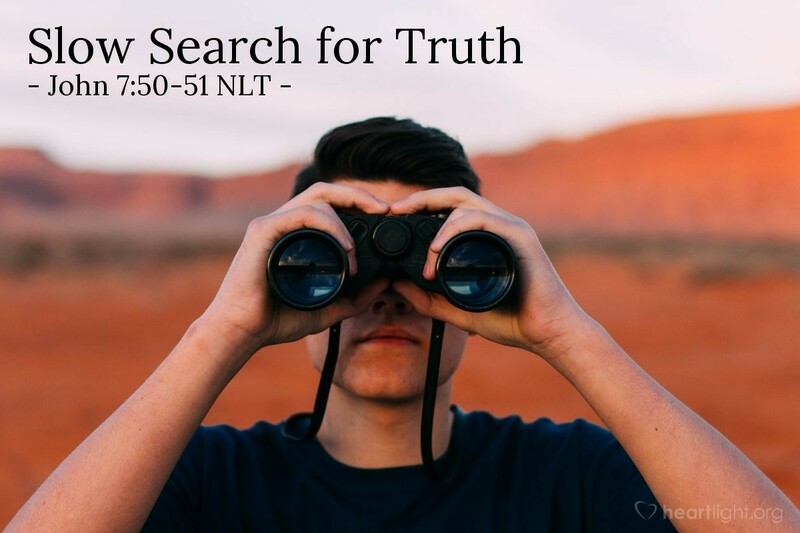 Even in today's verses, in a hostile setting, Nicodemus' search for truth and his love of integrity called him to stand up for Jesus. For me, Nicodemus is a great reminder not to give up hope on those around me who have not yet become Christians, but who keep having Jesus tug at their hearts. Let's not give up on these precious people in our lives, but let's work and pray for them to come to see Jesus in light of the cross! Father, please be with the folks in my life who are good-hearted and genuine, but who haven't responded yet to the call of Jesus. Help me as I try to make my life a consistent and helpful witness to Jesus and his transforming power. Guide my words and give me wisdom for the proper timing to know when to talk with them about Jesus and what to say. Most of all, please be at work in their lives just as you were in the life of Nicodemus and bring them safely into your Kingdom. In Jesus' name, I pray. Amen.